Approaching the stately 5054 square-foot Sandpiper model single-story home at 10002 SE Sandpine Lane in the Medalist, you are greeted by a sweeping circular drive set with interlocking pavers, 4 large oak trees, and garages flanking both sides of the symmetrical house with Bahama shutters. Upon entering the front door, you can see the elegant polished marble set on the diagonal in 24” squares that continues through all the living areas of the home, including all hallways, leaving the bedrooms as the only carpeted areas of the house. The marble sets the sense and tone of the house; you can just feel that the architect, owner and interior designer had great taste. As you stroll through the house, you will note first that all of the living areas, library and master bedroom have open views to the pool and natural plantings beyond, the varied coffered ceiling details, with each room having both floor and ceiling architectural mouldings. The living room has a stone-clad fireplace, the windows are flanked by linen sheers, and throughout the entire house there are electric driven shades as well as on the covered loggia next to the pool. Between the formal dining room and kitchen is a granite-clad butler’s kitchen and hidden pantry for serving pieces overlooking a hallway wine cellar with over 200 slots for your favorite beverage. The kitchen has a massive 65” x 112” floating granite island, all Thermadore appliances; a real gourmet chef’s kitchen, open to the family and breakfast rooms as well as overlooking the pool and lush natural greenscape. The family room has a beautiful wall unit with a 50” TV. Besides 5 full marble baths, there are 2 half baths, the exquisite powder room, and one off of the pool. The master bedroom is in the south wing, separated by the antique wood library from the living room. The bath complex has a huge lady’s closet, a challenge for even a shopaholic to fill, and there is a very large separate bath for the man of the house. Both baths have their own showers, everything top-to-bottom in the same marble. The master features a sitting area in an extended bay window setting. The oversized pool, hot tub and planters within the pool are all covered by a fine mesh screen to protect at dawn and dusk from the tiny no-see-ums. With its western rear exposure, the pool is flooded by sunlight throughout the day. There is a summer kitchen and BBQ. The views are both of the golf course and natural native trees and plants. 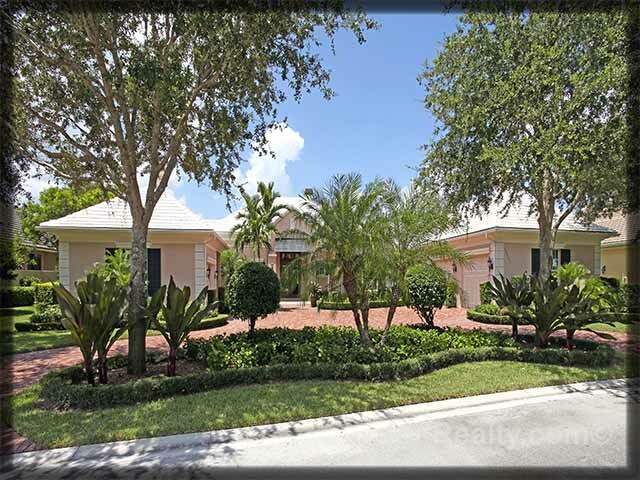 Posted in golf community, Medalist, Medalist homes, Medalist homes for sale on August 10, 2012 at 8:58 am.